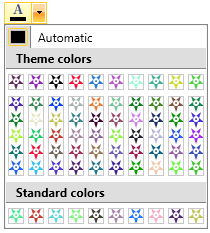 This article will show you how to use the RadColorPicker in MVVM scenarios. Also, we will show you which properties to bind and how to create a custom View and ViewModel. For the purpose of this example we will create a ColorModel class and three ObservableCollections of ColorModel which will be named as follows: StandardPaletteColors, MainPaletteColors and HeaderPaletteColors. The ColorModel class will expose a CustomColor property of type Color. Next we will define the MainViewModel which will wrap and fill the collections of ColorModel objects. After this is done we can prepare the View of our application. We will use customized Path to visualize the different colors. In order to do this we will define a custom DataTemplate as the PaletteItemsTemplate property of the RadColorPicker. Also, we will bind our collections (defined in the MainViewModel) to each of the following properties of the control: HeaderPaletteItemsSource, MainPaletteItemsSource and StandardPaletteItemsSource. Please note that in MVVM scenarios you have to set the RadColorPicker.ColorPropertyPath. This is a path to a value on the MainViewModel that serves as the visual representation of the RadColorPaletteViewItem.Color. You can assume that the ColorPropertyPath mimics the behavior of the ItemsControl.DisplayMemberPath. Please note that this article doesn't demonstrate how to customize the ToolTip of the colors. If you need to implement such a scenario, please refer to this article.